The dust has well and truly settled on this year’s Vuelta and we are already into the world championships (posting this the day after the TTT). I’m a bit late to the game so I won’t do a blow by blow account of the race post the second rest day; rather here are one or two reflections on this edition. Tom Dumoulin – breakthrough result? Just as heart ruling head wanted an Alberto Contador Giro Tour double earlier in the year I was pretty much rooting for Tom Dumoulin to take the overall victory; the prospect of which had been off most peoples radar three weeks ago. Even so when Fabio Aru limited his losses to Dumoulin in the TT I still wasn’t sure that the latter would have enough in his legs (leave alone any kind of meaningful time gap) to hold onto the leaders jersey he now held. If Dumoulin had been the surprise package of the 2015 Vuelta Aru delivered the surprise performance of the TT. No one expected Joaquim Rodriguez to do any more than babysit the race lead into stage 17 and he served up the expected ‘difficult’ result on his time trial bike. Just as Purito was likely to be horrible against the clock Dumoulin was expected to destroy his opposition and up to a point he did; finishing more than a minute ahead of the next rider on the stage. However Aru, who had looked pretty average through the first two time checks must have ridden the final sector like a man possessed (or at least in pursuit of his first grand tour win) and was within two minutes of Dumoulin at the finish. Purito lost the lead and fell to third while Dumoulin leapfrogged everyone and had a three second advantage over Aru. So at this point I wanted to see Dumoulin hang on; however improbable the chances seemed. The race was already going to be won by one of the undercard as we had lost Froome over a week previously and Nairo Quintana had never really looked like the rider who many (myself included) had tipped as the favourite. Aru had been handed a clear run thanks to the disqualification of Vincenzo Nibali and the lack of the pre-race big names left in the running was giving Rodriguez an outside chance of victory too. The biggest issue facing Dumoulin was that he was riding in a team that had been built around the sprinting ambitions of John Degenkolb (Dumoulin wasn’t even the team leader). On each day in the mountains Dumoulin had been left to find his own wheels to follow once Lawson Craddock (the only other recognised climber on the Giant Alpecin squad) pulled off. Dumoulin had shown he was capable of limiting his losses and the last of the summit finishes had been on stage 16 but could he really maintain a three second lead over Aru with difficult days still to come? Ultimately the answer was no but on stage 19 Dumoulin was able to increase his slender lead over Aru and the Astana leader was alleged to have needed a shove from a teammate as they approached the finish in Avila. I suppose this was the point where I started to think a Dumoulin overall win might be possible. Away for the weekend I was following the race via social media and race reports as I wasn’t even catching the ITV highlights package. It seemed like Aru might be the one who was cracking and I was working on the basis that any time Dumoulin lost on the climbs he could make up on the descents with non-uphill finishes on the final stages. I left off the 2015 Vuelta a Espana on the first rest day and ahead of the stage that many of us thought would point towards the rider most likely to take the overall this year. Last week we had long since lost Vincenzo Nibali from the race. Entered as ‘detention’ from his Astana team after failing to offer the expected heroic defence of his Tour de France title, insult was added to injury after he was disqualified for taking a wing mirror tow from his team car. Nibali’s early exit was forgotten as the first ten days racing witnessed the emergence of two riders to challenge the status quo among the GC contenders. Astana hadn’t made too much fuss about Nibali; they were geared towards Fabio Aru taking a first grand tour victory. Lining up against them, albeit not so ‘fresh’ from the Tour were Chris Froome and Nairo Quintana. The Vuelta’s knack of throwing up a surprise or two was evident in the relegation of the star names of the peloton to supporting roles as first Esteban Chavez and the Tom Dumoulin were the story of the first half of the race. Fabio Aru – chance gone? Chavez and Dumoulin had shared the race lead between them and taken three stage wins. Chavez was the ‘winner’ as far as quantity but Dumoulin was arguably the most impressive overhauling Froome to win stage 9 on a short but steep hill top finish near Calpe. It was Dumoulin who wore the leaders jersey after the race had transferred from the southern Spain to Andorra but with the sharks tooth profile of stage 11 ahead you would have been forgiven for thinking that if anyone’s luck was about to run out it would be Dumoulin’s. Instead the first casualty and second big name to exit the race was Froome. There have been enough incidents on this years edition of the Vuelta to satisfy the lawyers for years but the exact circumstances of what caused Sky’s team leader to break a bone in his foot aren’t crystal clear. The official version is that another rider collided with Froome causing him to hit an obstacle at the side of the road. That this rider hasn’t (yet) been identified suggests that it might have been what insurance companies call a 50:50 accident but that shouldn’t detract from an extremely gutsy performance from Froome to ride to the finish when it was clear afterwards that just walking a few steps to the car was difficult. We won’t know if he was able to challenge for the GC but it does look like the riders who went well at the Tour are struggling here, albeit for different reasons. Geraint Thomas gave Froome a wheel to follow and pretty much ended his chances of being a factor in the race but Mikel Nieve has emerged from their shadow and looks likely of delivering his best ever result in any grand tour. Nieve wasn’t the best Sky rider on stage 11, that went to Ian Boswell who looks a far better rider than when he was hanging off the back of the peloton in Paris Nice in 2013. Otherwise the top ten was compiled with the names you would have expected to see at the sharp end of a very difficult 158km stage. Dumoulin did lose the race lead to Aru but by less time than many would have predicted. In fact Dumoulin came in just over a minute and half back on Aru in company with Chavez who had pretty much wheel sucked the Dutchman up the final climb. While Aru took the jersey he didn’t win the stage. Sky bound Mikel Landa stuck a metaphorical finger up at his current employer by turning a deaf ear to requests that he should wait for his team leader and soloed to victory. The result saw Dumoulin drop to third behind Aru and Purito Rodriguez the ‘designer’ of the stage if you were to believe Carlton Kirby on Eurosport. Aru kept the lead until yesterday (stage 16) but the narrative of the race has been less about him and his successor on GC Rodriguez than about Dumoulin. Only 30 seconds down on Aru following stage 11 Dumoulin has become the story to the extent that the other teams seemed to change their respective strategies to one focused solely on putting time into him ahead of the TT (stage 17). Under ‘normal’ circumstances the stage might have been in two parts with Dumoulin and (say) Fabian Cancellara putting down a marker for the world championships and the GC guys attempting to gap their rivals. Instead we have the prospect of Dumoulin assuming the race lead once more and potentially holding it to win the Vuelta overall. This has as much to do with Dumoulin being the surprise package on GC as for the fact that Aru seems to missing the last few ingredients that would have allowed him to get a grip on the race. With only a one second lead over Rodriguez ahead of yesterdays stage Aru had his ‘worst’ day out of the last three as Dumoulin was having his best. Rodriguez had done the damage on stage 15 with a 15 second advantage over Aru plus a 10 second bonification on the line to allow him to touch the hem of Aru’s leaders jersey. A day later it was on Purito’s shoulders as Aru had to come from behind to try and limit his losses. And so we have the prospect of a watchable TT stage. Of course now that Dumoulin is no longer a surprise the talk is of not will he win the stage but by how much. With Nibali and Froome long gone there isn’t a decent tester in the top 10 with the possible exception of Quintana (remember him?). The Vuelta may yet have more surprises in store. There are a few more cat 1 climbs for the peloton to get over before the race reaches Madrid but we’re done as far as summit finishes are concerned. The Vuelta in its current incarnation has developed a habit of delivering a curve ball for us. Might this year’s curve ball be a Tom Dumoulin victory? Who knows who it was who coined the phrase; “The Tour is the Tour”. This is the catch all that is used to explain the goings on that characterise the world’s greatest stage race from the guy who dances around the finishing kilometre dressed as a giant ham sandwich; the drunken Dutch that spend a week on Alpe d’Huez; the fact that this is the only professional bike race that transcends professional bike racing. Of course the route just provides the stage (in the theatrical sense) and the riders are the players in the same context. Chris Horner could hardly have been described as an emerging talent in 2013 but whatever you choose to think about the merits of his unheralded victory two years ago it was so surprising it made for compelling viewing and the only grand tour that was genuinely decided on the final stage in 2013. The dramatis personae listed ahead of this years race, the Froome’s, Quitana’s and Valverde’s have only had cameos to play so far. The stars of the show in the first week have been comparative understudies; Esteban Chavez the almost childlike Orica Green Edge climber and Giant Alpecin’s Tom Dumoulin. There was a fair amount of chatter about Orica beginning to move their sights towards the grand tours although much of this had focused on the Yates twins. The announcement that the team had signed Amets Turruka from Caja Rural as a climbing domestique ahead of the Vuelta backed this narrative but it’s hard to believe that the team expected Chavez to have a week like this one. Not one but two stage wins and the leaders jersey for six out of ten days of racing must have been beyond the teams wildest dreams surely. They didn’t just have Chavez to celebrate either with Caleb Ewan taking his maiden grand tour stage win. Chavez played pass the parcel on GC with Tom Dumoulin who had already come to the fore this year as a rival to Tony Martin but certainly not as a grand tour overall contender. Chavez has been a joy to watch on and off the bike and you have to go with the instinct that says he was praising his rival when he described Dumoulin’s reclaiming of the race lead as “unbelievable” almost every other word. Dumoulin’s explanation is that he feels good and that he has lost some weight ahead of the race but more cynical eyebrows might be raised if he is still in pole position after four cat 1 and one HC climb on Wednesday. The home fans (and the wider audience) find Chavez easy to fall for. He has been charmingly humble about his prospects and it is hard to see how he could prevail against Sky and Movistar at the very least over two more weeks of racing and arguably the toughest week to come this week. The locals ought to be able to take Dumoulin to their hearts as well; a time trailing grand tour winner? I’m pretty certain Spain has had one of those in the not too distant past! So what of the pre-race favourites. So far not much. They have seemed content to only briefly test their firepower; a stage win for Valverde and Froome going close on Sunday only to be overhauled by Dumoulin at the death. Vincenzo Nibali has capped his miserable season by getting himself disqualified for riding on a team car on stage 2. What Nibali did may or may not be the worst excess of cheating, even in this race, but he was caught (on camera) and was gone without much in the way of genuine protest. He was remarkably prescient on the inconsistency of fines for transgressions within the race when Nacer Bouhanni escaped a similar sanction for an even more blatant car surf the following day by which time Nibali was already licking his wounds at home. Bouhanni has gone now too. The race has been attritional for sprinters in particular whether that be through injury or simply practical longevity concerns. Ewen has withdrawn in much the same way as the Yates boys were protected at the Tour last year. In what was already a shallow field John Degenkolb might have been expected to fill his boots in much the same way as he has in previous years but he has been relatively quiet so far. The first week of the 2015 Vuelta has delivered. The organisers might have preferred a Quintana or Valverde in the leaders jersey but in all other respects this years race has provided something for everyone from surprisingly challenging climbs to exciting emerging talents on GC. Tomorrow ought to be fireworks from start to finish as it’s difficult to imagine one team being able to control the race over that many climbs. After such an entertaining first half of the race it’s to be hoped that the rider who emerges from stage 11 at the head of the GC doesn’t grip the race lead too tightly. But the Vuelta is the Vuelta and no doubt there will be more surprises to come in the next ten days. The Ruta del Sol or Tour of Andalucia or Vuelta a Andalucia (depending on your preference) finished last weekend. The only ‘live’ cycling on offer to the armchair fan last week was shown perhaps less because of the race’s sixtieth anniversary than the fact that coverage was available for Eurosport. Most of the ‘smaller’ races shown on the digital channel are commentated on from a studio in London, probably not in homage to the days of Murray Walker and James Hunt sharing a microphone during the BBC’s grand prix coverage in the 70’s and 80’s, but for obvious cost reasons. Eurosport had people on the ground in on the Costa del Sol in the shape of the delightful and multilingual Laura Meseguer and it may not have been entirely unconnected that we enjoyed rather a lot of pre-stage interviews mixed in as the race unfolded. Any confusion over what to call the race arises in VCSE’s view from the fact that the Ruta del Sol is less a tour of Andulicia than one of those coach bound day trips marketed to pensioners in the back of local newspapers. The Ruta lasted four days with an opening prologue followed by three stages. This years Vuelta a Espana kicks off in the south so there was some interest in seeing what passes for a cat 1 climb in southern Spain. Sum up; they seem a bit easier than the ones in Galicia. In the opening prologue it looked for a long time that Sky super domestique and automaton Vasil Kiryenka would take the win and leaders jersey. Sky had Richie Porte and Bradley Wiggins at the race and whatever their respective roles were likely to be for the rest of the week Wiggins would normally start out favourite against the clock. So it goes, and Wiggins did indeed beat Porte but he finished down on Kiryenka and Geraint Thomas. A top ten finish suggested that Wiggins was trying at least at this point. By the closing km’s of stage one it appeared that some of the demons of 2013 hadn’t been completely exorcised as he was one of the first of Sky’s train to pull out of the line on the final climb. This could (of course) be unfair; the plan for Britain’s first winner of the Tour de France has already been heavily trailed with Wiggins headed for Paris Roubaix and, perhaps, team leadership at the Vuelta. Nevertheless, knowing what we do now about how Wiggins had been reluctant to ride the Giro last year is it possible that Sky are pushing him towards races simply to earn something (anything) from their investment? In fairness to Wiggins he repaid his employers and more in winning the Tour ahead of Dave Brailsford’s five-year target and a small stage race early in the season is the wrong place to make sweeping conclusions. Wiggins remains a more compelling and complex character than the man who has usurped him as leader Chris Froome and the racing scene seems more enjoyable when Wiggins is enjoying his racing as with last years Tour of Britain. But enough for now of the trials of one fallen hero and on to another. 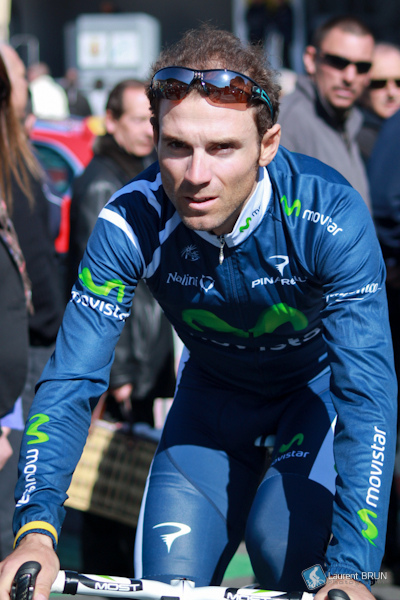 Alejandro Valverde was victorious in the prologue and in the next two stages. A three-time winner of the Ruta del Sol, there was still some surprise that he won the prologue. Valverde is a pretty divisive rider for reasons that can be counted off on each finger should you have enough hands and the inclination to do so. His unrepentant approach to doping historically and to quote a more recent example his apparent surrender during the worlds last year denying countryman Joaquim Rodriguez the win. With the lovely Laura on hand to interview and Rob Hatch providing a fluent translation we were treated to Valverde thanking his team and family if not his doctor at the end of each stage. Anti doping has caught up, if not exactly caught on in Spain in recent years, although there is a sense that the relative decline of the countries sporting greats (not only in cycling) have paralleled these developments. It doesn’t feel right to be too cynical this early in the season, but it will be interesting to see if Valverde can repeat this kind of form outside Spain as the season progresses. VCSE suspects not. Marcel Kittel was absent from the race, so Giant Shimano had to look elsewhere for a result. Tom Dumoulin came close in the prologue and in a break on the final stage. While the dutchman received no help from his compatriots on the rival (dutch) Belkin squad, he might have been better selecting one of Giant’s Propel aero frames for his breakaway. Last year Giant were bike sponsors for Belkin, although this team ran under the nom de plume Blanco until the Tour in a very similar team uniform to this years Giant Shimano outfit. Looking at Dumoulin pedalling squares as he attempted to stay clear of the peloton on stage four VCSE wondered if it was possible that Giant had saved themselves some money by recycling some of the old Blanco bikes into the Giant Shimano service course this year. It’s felt a bit like a television column as much as road racing comment so far this year. Not that this years racing has been short rationed. So far, VCSE has enjoyed the Dubai Tour as well as the Ruta del Sol live on Eurosport where last year it was highlights only from races like the Tour of Oman. In many ways Oman is the poor relation to the other races held in the Arabian peninsula during February, although it often serves up the most interesting stages. Last year saw Chris Froome taking, what seemed inexplicable at the time, his first ever stage race victory. His performance was made more emphatic by the riders he saw off on the climb to the top of the Green Mountain; Joaquim Rodriguez and Alberto Contador. Froome was back this year to defend his title, although the field was a little less than stellar to challenge him. The viewing was a bit underdone too. Unable to get the funding to deliver live racing a half hour highlights package was served up the day after each stage accompanied by the sort of martial music that would top the charts in North Korea. It’s disappointing that a race that offers far more than its counterparts in Dubai and Qatar cannot pull in the revenue to justify a live feed. No doubt it’s out there somewhere (Al Jazeera Sport anyone?) but this years version felt, like the Ruta del Sol above, something less than it promised. Rain might not, but snow certainly will. Last year VCSE returned from a weeks riding on the Isle of Wight ready to enjoy the first of the Belgian spring races, Kuurne Brussels Kuurne. You know how it is, avoid social media for the day and then hit the Sky Plus box with an appropriate beverage to enjoy the action. At the time the self induced social media blackout meant that the cancellation of the race due to the weather had passed us by. All that was left to do was to blame the Sky box. Twelve months on and it’s 99.99% certain that the race will go ahead, the day after Het Nieuwsblad (which managed to run last year). The spotlight will be on Tom Boonen in his comeback year from injury in 2013 and he will turn out in both races this weekend. Last years winner Luca Paolini goes for Katusha although it’s hard to see last years cat and mouse style finish being repeated. 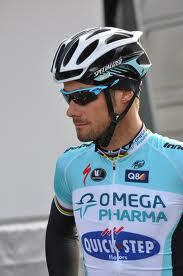 BMC have Thor Hushovd and Greg van Avermaet and could provide tough opposition for Boonen. Also lining up in his first race since leaving Boonen’s Omega Pharma team is IAM cycling’s Sylvain Chavanel. Chavanel has a point to prove this year and another rider to look out for is Garmin’s Nick Nuyens. Many of the same riders will turn out on Sunday with riders like Belkin’s Sep Vanmarcke elevated to team leader status. With last years hiatus the previous winner of the semi-classic was (at the time) a Sky rider, but Mark Cavendish is absent this year. Sky will be led by Edvald Boasson Hagen this year, but the Norwegian will be an outside bet if this race comes down to a sprint. The rider who showed last year that he could adapt to the shorter climbs of the cobbled classics was Andre Griepel and if it it’s in a bunch at the close on Sunday he is the VCSE favourite.